Valentine’s Day is a day to celebrate love and show your appreciation for family and friends. But lately, Valentine’s Day has become a major spending holiday, with expectations for gifts and dates getting more and more expensive. According to ABC News, consumers across the country will spend $18.2 billion on this holiday, which averages out to about $130 a person. But you don’t have to disregard your budget to show your loved one that they matter. Let’s look at responsible ways to celebrate with less expensive options, savings plans, and other ways to invest that money. Take on Some Housework - Nearly every spouse will tell you that when their husband or wife picks up some of the housework, it doesn’t go unnoticed. If you want to give your loved one a free (and much appreciated) gift, help with the chores! Whether it’s cleaning up the house, packing the kid’s lunches for the week, or doing laundry, this simple and caring gesture will go a long way. Tech Detox - There’s no denying that in today’s day and age, we are glued to technology. Between checking emails, texting friends, keeping up with the news, and more, we spend less time with those around us and more time with our screens. For Valentine’s Day this year, give your spouse a 24-hour tech-free day, where the two of you can just enjoy each other’s company. You both are sure to enjoy the distraction-free time together. Handwritten Notes - There’s nothing quite as special as receiving a handwritten note from someone you love, so this Valentine’s Day channel your inner poet and write your loved one a letter. You could even plan a mini scavenger hunt throughout the house and leave little love notes on funny places for your spouse to find. There’s nothing wrong with a gift here and there, and expressing your love through presents doesn’t necessarily mean you have to blow your budget. There are plenty of ways to save for a gift without having to let it affect your normal expenses. Consider what you want to buy your spouse and set aside some spare change here and there to save up .An easy way to do that is to have some money automatically transfer into a savings account, by doing this it makes saving easy by automating the process. 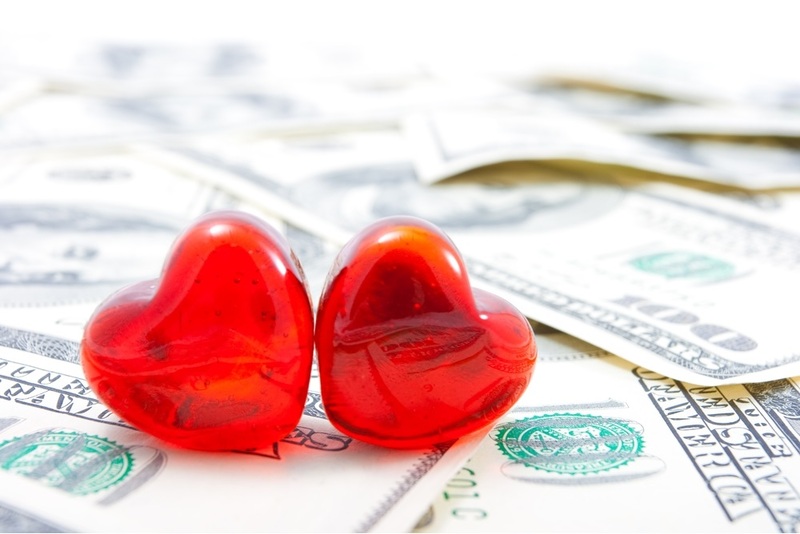 If you are planning a major purchase, work with a financial advisor to set up separate savings accounts to keep your Valentine’s Day gift in line with the rest of your financial goals. While flowers will die or chocolate will be enjoyed, setting up an investment account for you and your loved one is the gift that keeps on giving! Instead of spending hundreds of dollars on a Valentine’s Day gift, consider investing that money for future returns. Whether you want to set up a savings account for a future vacation, upcoming expenses, or retirement, putting aside the money you would spend on this holiday will get you one step closer to your goals. Working with a reputable financial advisor may be able to help you turn that $130 into a growing investment account. February 14th represents a day of love, but it is also one of the most expensive days of the year. Rather than turning to traditional gifts, consider ways you can show your love through time or energy, save for a gift proactively, or use that money for something worthwhile, like saving for a larger goal.